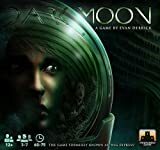 Dark Moon is different than other hidden traitor games in that the traitor's destructive actions take place publicly for everyone to see, rather than behind a hidden veil. Good acting and solid deception skills are invaluable, and traitors with poor poker faces will quickly be revealed. Because of this, the game can seem unbalanced toward the Uninfected team at first. Inexperienced Infected players may be caught early, play it cautious, or reveal themselves at the wrong time. They may feel they can't alter the outcome of the game or prevent the forward momentum of the Uninfected team. In reality, the Infected have an enormous amount of power if played correctly. These rules are written and balanced with experienced players in mind who understand the game's rhythms and know how to successfully leverage the Infected team's advantages. Before your first game, be sure to refer to the strategy guidelines found on pg. 16, which may be helpful for new players. If your group feels the game is too easy or difficult for either side, there are variant rules included on pg. 17 that can be used to shift the balance in either direction. The Uninfected team wins if they survive until the end of the game. In order to survive, they must successfully complete three Events and the Final Event. totally compromising the life support systems so that the entire crew succumbs to fatigue. The Infected team wins the instant any one of these three conditions is met. Place two Shield tokens on the first two spots of the Shield Track and place the remaining four in a pile next to the board. Randomly draw and place two Outpost tokens on the appropriate spots on the Outpost Status panel and place the rest in a facedown pile next to the board (the consequences displayed on the drawn Outpost tokens take effect immediately). Place the Fatigue tokens in a pile next to the board. 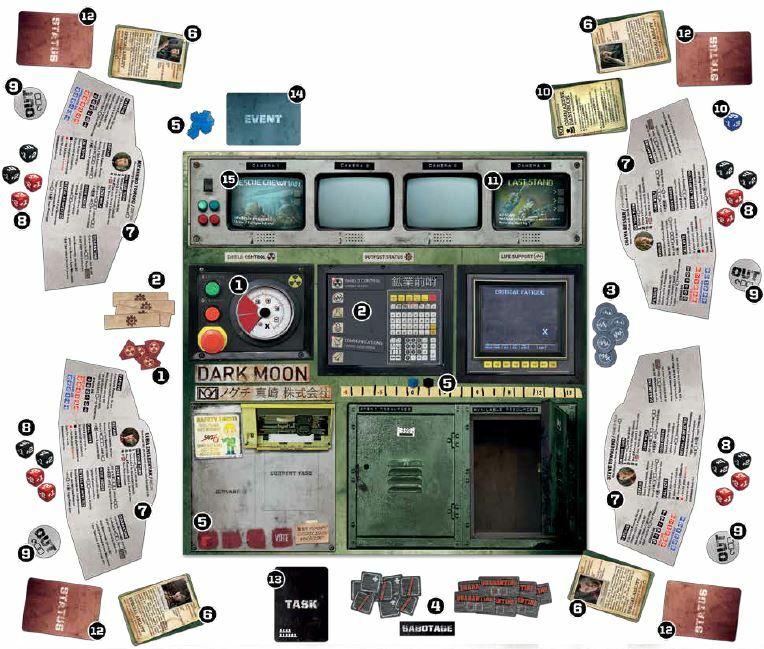 Place the Sabotage, Die, and Quarantine tokens next to the board. Place the red Suspicion cube at the beginning of the VOTE track, a single blue and black cube above the Difficulty track, and the remaining blue cubes (the Event cubes) in a pile next to the board. Shuffle the Character cards and deal one Character card faceup to each player. Give each player the Uninfected Player Screen that matches their Character card. Give each player two black Strong dice and two red Weak dice. Give each player a Participation token. Randomly draw Fatigue tokens until you've found one that matches a Character in play. 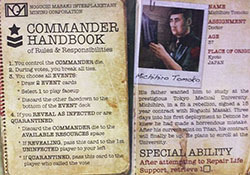 That Character is the starting Commander and receives the Commander card and the blue Commander die (this means that any player who receives the DANIEL Character card will never start the game as the Commander). Randomly draw a Final Event card and place it faceup on the board on the Camera 4 space (alternately, players can agree on which Final Event to use). Place the remaining Final Event cards back in the box; they will not be used this game. Depending on how many players you have, consult the chart on the bottom of the page to determine how many Uninfected and Infected Status cards you'll need in the game, as well as which deck of Task cards to use. Shuffle the four Infected Status cards together, randomly selecting the number needed for the game and placing them facedown. Place any unused Infected Status cards back in the box without looking at them. Form the Status deck by shuffling the selected Infected Status cards with the correct number of Uninfected Status cards. Deal one Status card to each player, facedown. Choose one player to give a loud, steady count to 10. During the count, every player looks at their Status card at the same time and reads the text silently. 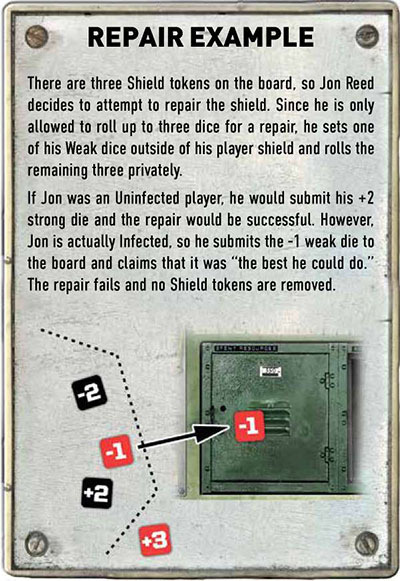 Players must not put their cards down until the count is completed, as this gives the Infected team a chance to read their cards without revealing they're Infected. Shuffle the appropriate Task deck (silver for 3, 5, or 7 player games; black for 4 or 6 player games) and place it next to the board. Shuffle the Event deck and place it next to the board. The Commander draws two Event cards, placing one faceup on the board on the Camera 1 spot and placing the other at the bottom of the Event deck (see pg. 12 for an explanation of the Event cards). No other player should see the Event card that was discarded. The player to the left of the Commander will be the start player. Proceed clockwise around the table. Players complete actions, hold votes, complete Tasks, and finish Events during the game by rolling dice and submitting them. Unless otherwise stated, dice rolls are always private, and a player may never reveal what they rolled to another player. The only dice that are seen publicly are the ones that a player chooses to submit. Note: Whenever the term "players" is used, either in this rulebook or on any card, it refers to either Uninfected players or Infected players who have not yet revealed themselves. Whenever the term "Infected players" is used it refers to players who have revealed their Status cards and are openly playing for the Infected team. The active player retrieves as many dice from the available dice pool as needed to match their die limit (at the start of the game this step is skipped since everyone will have their maximum number of dice). For example, if a player has two dice at the beginning of their turn and their die limit is five, they must retrieve three dice from the Available Resources pool. They may choose any combination of Weak or Strong dice. Only the Commander may retrieve the Commander die. The active player may perform one of the following actions, assuming that the appropriate Outpost station needed to perform that action hasn't been damaged. There are three kinds of repair actions. When attempting a repair, the player rolls up to three of their dice and submits one (they may roll fewer than three dice, although this will reduce their chances of success greatly). If they have more than three dice, they may still roll no more than three. If the die they submit is positive, the action is successful. If the die they submit is negative, the action fails. If the shield has begun to fail (indicated by Shield tokens on the board), a repair of Shield Control may be attempted. If successful, remove the Shield token that is farthest on the Shield dial. If life support functions have dropped to dangerous levels (i.e., players have become fatigued), an attempt may be made to restore them. If successful, any one Fatigue token may be removed from the board and shuffled back into the pile of Fatigue tokens. Players do not have to declare which Fatigue token they intend to remove before making the attempt. If an action spot has been blocked because an Outpost station has been damaged, an attempt to repair the station may be made. If successful, any one Outpost token may be removed from the board and shuffled back into the pile of Outpost tokens. That action is now available for players to use. Players do not have to declare which Outpost token they intend to remove before making the attempt. Note: Repair Outpost is the only action that is always available to players, no matter which stations have been damaged. A player may call a vote to either 1) quarantine a player or 2) release a player from quarantine (a player may call a vote on themselves). All players then hold out a closed fist and simultaneously reveal what they've concealed inside. A black Strong die is a vote that the player is UNINFECTED and should not be in quarantine. 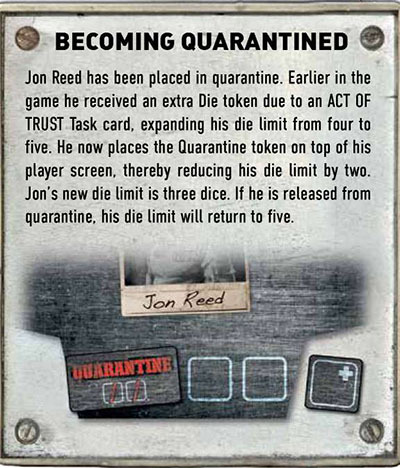 A red Weak die is a vote that the player is INFECTED and should be in quarantine. An empy hand means the player has abstained from the vote. Note: The Commander die may NOT be used to cast a vote. A player may be forced to abstain if they have no active dice or if they do not have the color of die they want to vote with. They may also willingly abstain, even if they have active dice they could vote with. If the majority of players vote that the player is Uninfected, that player is either released from quarantine or they remain free from quarantine. If the majority of players vote that the player is Infected, that player is either placed in quarantine or they remain in quarantine. If there is a tie, the Commander breaks the tie however they wish. After the vote, players place any dice used in the vote behind their player screen with their other active dice. The active player may become a "lone wolf" and go it on their own, attempting to add an Event cube to the current Event all by themselves. That player rolls up to three dice and submits two. If both submitted dice are positive, the action succeeds and an Event cube is added to the current Event or Final Event card. This may complete the Event, in which case the Commander immediately draws two new Event cards and chooses one before the active player's turn continues. If successfully performing this action causes the Final Event to be completed, the Uninfected team immediately wins the game. perform any two actions they would normally be able to perform. Note: If a player is issued an order and chooses to perform two actions, neither of those actions may be issue order. If upon receiving an order, a player's first action is reveal as infected, they may immediately perform an Infected action. Therefore, give orders carefully. Note: If a player is given an order, they may NOT use their Character ability while performing actions, as they are not currently the active player. If a player holds an Infected Status card, they may reveal it and publicly switch to the Infected team. After performing an action, the player draws two Task cards from the Task deck and chooses one, playing it faceup on the Current Task space for all players to see. The other card is discarded facedown to the Discard space. If there are no cards to draw, take all discarded cards, shuffle them, and form a new Task deck. Note: When forming a new Task deck, be careful not to reveal the Task cards in the face-down discard pile, as this could unfairly reveal how players have acted when choosing Tasks. There are two types of Tasks: Malfunctions and Complications. 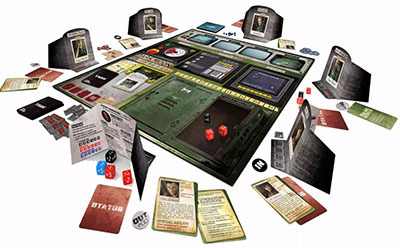 Malfunctions come in four different types and will require players to collectively roll their dice in an attempt to fix the malfunction (or, in the case of the Infected players, possibly cause everyone to fail). 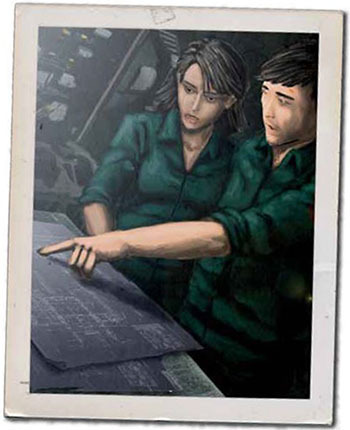 Complications feature an illustration and require the player or players to make a choice of some kind. If the Task chosen is a Malfunction, place the blue Difficulty cube on the appropriate number on the Difficulty track, and place the black Success cube on 0 on the Difficulty track. Beginning with the current player (the one who chose the Task card) and proceeding clockwise, each player and Infected player chooses whether they're IN or OUT. In clockwise order, they flip their participation token to the appropriate side for everyone to see. If a player or Infected player is OUT, they immediately take up to two dice from the Available Resources spot as long as they don't exceed their die limit. Although players begin with two Weak and two Strong dice, there is nothing to prevent them from having all Weak or all Strong dice later in the game (it is usually advisable, however, to have a mix of dice in order to keep your options open during any votes that may occur). Each player or Infected player who is IN, starting with the active player and proceeding clockwise, rolls and submits dice. No one is allowed to roll their dice ahead of time and see the results until it is their turn to submit dice. All players and Infected players who are participating in the Malfunction must roll and submit at least one die. When completing Malfunctions, players and Infected players may reroll their dice as many times as they choose. However, every time they roll their dice they must submit at least one of those dice, although they may submit more than one. This holds even if the outcome of the Malfunction appears inevitable; if dice were rolled, at least one must be submitted. Note: The fewer dice a player has, the greater their chances of rolling all negative numbers. Uninfected players must carefully weigh the risk of continuing to roll, as they may do more harm than good. Hidden Infected players can take advantage of this, as it is less suspicious to submit negative numbers when you roll fewer dice. Every time a die is submitted, move the black Success cube up or down on the Difficulty track the appropriate number. Each positive die submitted counts toward success; each negative die submitted counts toward failure. Submitted dice are placed on the Spent Resources space on the board. After the Task has been resolved (but before conseguences occur or Event cubes are added) move all dice from the Spent Resources pool to the Available Resources pool. Once all players and Infected players who chose to participate have rolled and submitted at least one die each, check the total. If the final result is equal to or higher than the difficulty number, the Task is successful. If the result is lower than the difficulty number, the Task fails and the consequence listed on the Malfunction card occurs. If the Malfunction happened in the outpost, the consequence is that one or more outpost stations become damaged. Randomly draw and place a number of Outpost tokens on the Outpost Status section of the board equal to the consequence number shown on the card. If the sixth and final Outpost token is placed, the outpost's critical systems enter permanent failure, resulting in everyone's death. The Infected team immediately wins. Each Outpost token has a specific consequence when drawn, preventing the players from taking certain actions. These consequences remain in effect until that station is repaired. If the Malfunction happened in life support, the consequence is that environmental conditions have deteriorated, resulting in one or more crew members becoming fatigued. Draw a number of Fatigue tokens equal to the consequence number on the card and place them on Life Support section of the board. If the Fatigue token drawn is the sixth and final one, the crew has become catatonic and the Infected team wins. If the Character on the token is not in play, the Fatigue token still counts toward the Infected team's win condition but does not penalize a player. If the Character on the token is in play, they have become fatigued. If the Malfunction happened to the shield, place a number of Shield tokens equal to the consequence number on the next available spots on the Shield track. 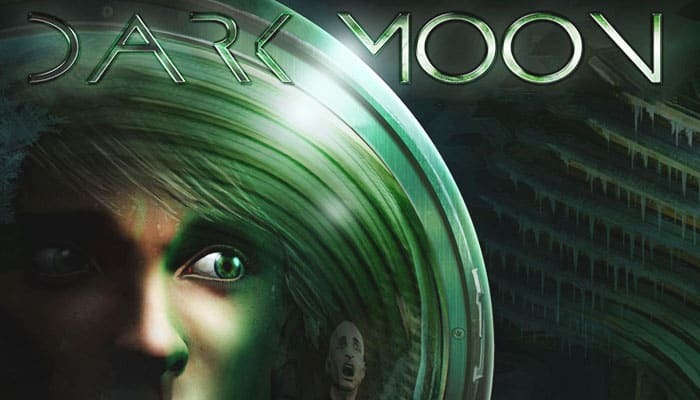 If the sixth and final Shield token is placed, the shield fails completely, exposing the outpost to the destructive conditions on the moon. The Infected team wins immediately. After placing the tokens the shield must be tested. Check the current Failure Condition (-1, "ANY +", -2, and "ANY respectively). Roll any die available (if there are no dice on the board, a player may roll one of their own, but it is not submitted. The color of the die does not matter). 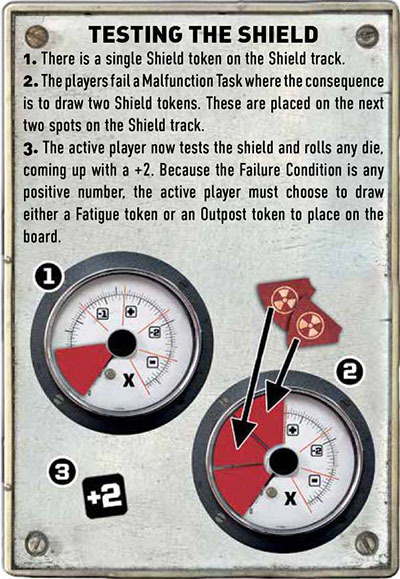 If the result matches the Failure Condition, the shield test has failed and the active player must choose to either 1) draw a Fatigue token or 2) draw an Outpost token. 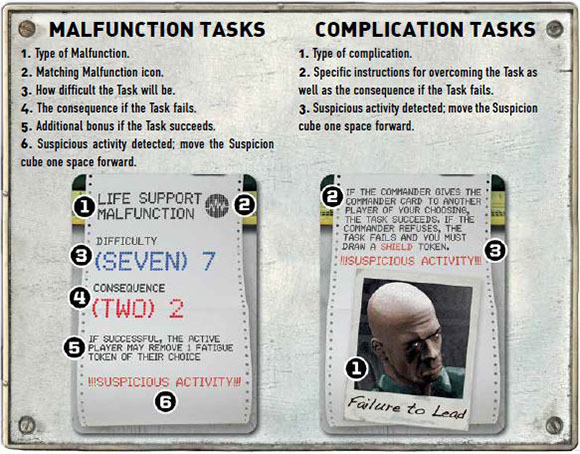 These Malfunction Task cards allow the active player to choose which Malfunction occurs: an Outpost, Life Support, or Shield Malfunction. This choice must be made BEFORE players and Infected players choose to participate and roll dice. 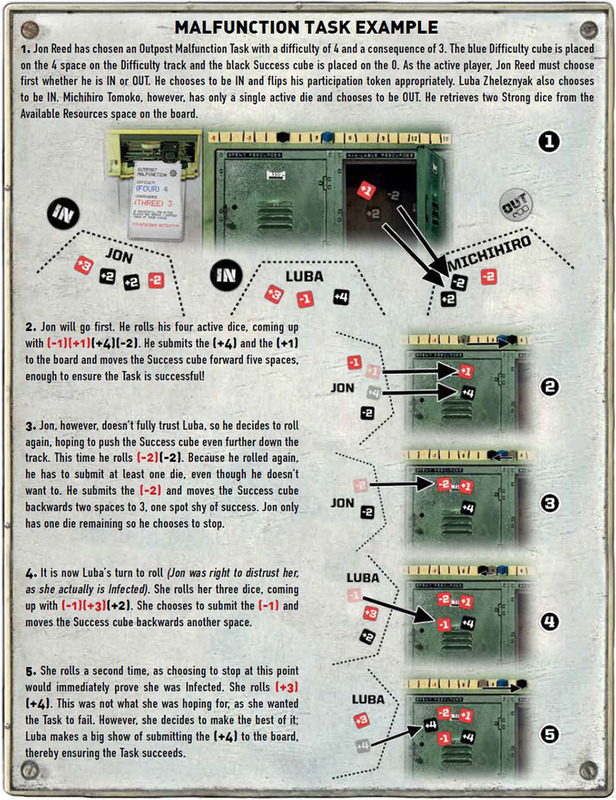 If the Task chosen is a Complication, the player (or players) will be required to make a choice, at which point they will succeed or fail based on the instructions listed on the card. If they succeed, the Task is successful. If they fail, the consequence listed on the card occurs. If the Task was successful, add an Event cube on the next available empty spot, either on the current Event or Final Event card. If the last Event cube was added to an Event card, that Event is completed and the Uninfected team is one step closer to victory. Execute the Event Text on the card if applicable. If the completed Event was the Final Event, the Uninfected team wins the game. Note: If the Event card, when completed, calls for Damage tokens to be added, add them until doing so would cause the game to end in an Infected victory. For example, if the Event card calls for two Fatigue tokens to be added and there are already four on the board, add the first but do not add the second as it would end the game. This does NOT apply to Final Events. If a Final Event card calls for adding Damage tokens and doing so would cause the game to end in an Infected victory, then the Infected team wins. 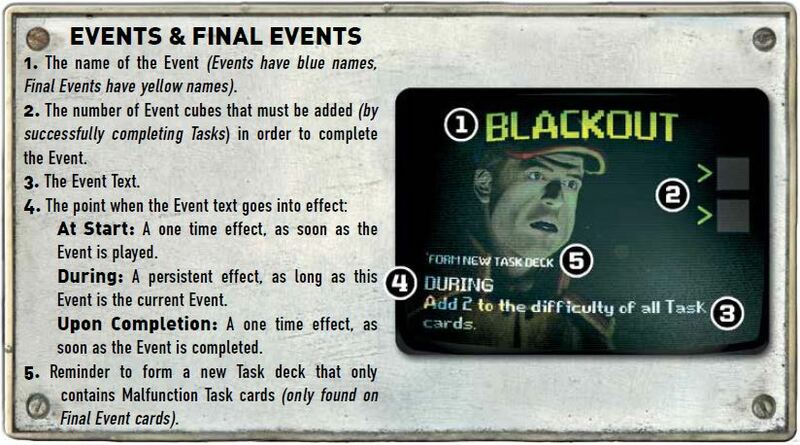 If an Event was successfully completed, the Commander draws two more Event cards, placing one faceup on the board in the next spot and discarding the second facedown. However, if it was the 3rd completed Event, players immediately proceed to the Final Event and the Commander does not draw any cards. If the Task card said "SUSPICOUS ACTIVITY!!! ", move the Suspicion cube forward on the Suspicion track. The cube is moved forward regardless of whether the Task succeeded or failed. If the Suspicion cube has reached the final space on the Suspicion track, a vote MUST now be called. The active player must choose a player to vote on (they may choose themselves or a player already quarantined). After the vote, reset the Suspicion cube on the track. Play then proceeds clockwise to the next player. Note: Even if the Research Lab Outpost token is on the board, it does not prevent this mandatory vote from occuring. When the Final Event begins, take all remaining and discarded Task cards, remove all Complication Tasks, and place them back in the box; they will no longer be used. Shuffle and form a new Malfunction-only Task deck with the remaining cards. Note: When forming a new Task deck, be careful not to reveal the Task cards in the facedown discard pile, as this could unfairly reveal how players have acted when choosing Tasks. When a player is placed in quarantine, place a Quarantine token in front of their player screen, covering up two of their die icons. Their die limit is now reduced by two dice. If that player has more active dice behind their screen than their current die limit allows, they must discard the extra dice to the Available Resources pool. They retrieve dice up to their die limit as usual. They may only use the actions CALL VOTE, ISSUE ORDER, and REVEAL AS INFECTED. If CALL VOTE and ISSUE ORDER have been blocked by Outpost tokens and the player is not Infected, then they have no available actions. They do NOT draw Task cards at the end of their turn. After performing an action, play passes to the next player. Quarantined players may still participate in votes and Tasks normally. If a player who was quarantined is released, they discard their Quarantine token and their die limit is increased by two dice (they do not automatically retrieve those dice, however). Note: Players always have access to at least one die, even if being quarantined would reduce their die limit to zero or fewer dice. If the Commander is successfully quarantined, that player loses the Commander card to the player who called the vote. 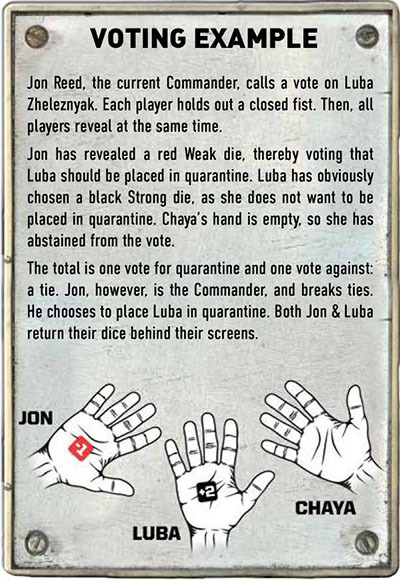 If the player who called the vote is in quarantine themselves (or if the Commander called the vote on themselves), then the Commander card passes to the first player to the left who is NOT in quarantine. Note: In rare cases, all players who are not revealed as Infected may end up in quarantine. If this happens, the last player to be quarantined retains the Commander card. The first player to be released from quarantine immediately assumes the Commander role. When a Fatigue token is drawn, if it matches a Character in play, that player must flip their Character card over. As long as that player is fatigued, they can't use their Character's special ability. Additionally, they may only submit a single die during a Malfunction (severely limiting their effectiveness). If the Fatigue token is removed due to a successful REPAIR LIFE SUPPORT action, the player flips their Character card back over, has access to their Character ability again, and can roll and submit dice normally. If not quarantined, they execute the Infection Power on their Status card immediately. They roll any available die; if the result is a positive number, they may execute their Infection Power a second time. They discard their Character card, their Quarantine token (if they were quarantined), any Die tokens, and their Uninfected player screen. If the Infected player who revealed was the Commander, the Commander card now passes to the first player to the left and the Commander die is placed in the Available Resources pool. They take an Infected player screen as a replacement. Observing their new die limit, they discard down to two dice, returning any extra dice to the Available Resources pool. Their turn is immediately over (unless they revealed as a result of the ISSUE ORDER action and revealing was their first action. In this case, they may immediately perform an Infected action). Choose whether they are IN or OUT during Malfunction Tasks and submit dice as normal. Passing during a Malfunction Task still lets the Infected player take up to two dice from the Available Dice pool. No longer draw Task cards at the end of their turn. Are no longer allowed to participate in votes. Cannot be voted on, be quarantined, or become fatigued. Are not affected by the Command Outpost token (when passing, they always retrieve two dice). No longer have access to the normal actions. Instead, they gain access to the following five new actions. Draw three Task cards. Discard as many as you want and return the remaining cards to the top of the Task deck in any order you choose. If there are 0-1 Shield tokens on the board, add one Shield token and, if applicable, test the shields. If there are two or more Shield tokens on the board, roll any die to test the shields. Check the result against the current Failure Condition. If it matches, draw either a Fatigue or Outpost token and place it on the board. Place the Sabotage token on top of the Shield Control, Outpost Status, or Life Support label on the board. Any player attempting to repair that area rolls and submits a die normally. Afterward, whether they succeeded in repairing or not, they must discard two dice to the board, thereby removing the Sabotage token. If they do not have two dice, they discard as many as they can. 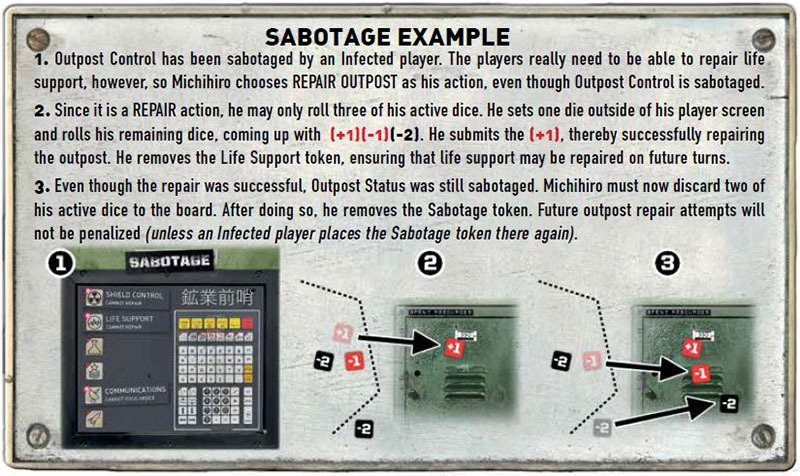 A player attempting to repair a sabotaged area will spend up to three dice: one for the repair attempt and two because of the Sabotage token. An Infected player may execute this action to move the Sabotage token from one area of the board to another, but there may only ever be one area that is sabotaged at any given time. The Commander must roll all of their active dice and submit one. If positive, the Commander is successful and nothing happens. If negative, the Commander fails and the Infected player may draw a Damage token of their choice. If the Commander has no active dice, it is an automatic failure. All players, beginning with the first to the Infected player's left, must replace all of their active black Strong dice with red Weak dice until there are no more Weak dice in the Available Resources pool.